A European robotic resupply spacecraft soared into orbit on an Ariane 5 rocket Wednesday, successfully beginning an eight-day chase of the International Space Station with fresh experiments, crew provisions, oxygen and propellant. The Automated Transfer Vehicle lifted off atop an Ariane 5 rocket at 2151 GMT (4:51 p.m. EST) from the French-run Guiana Space Center in South America. Dodging nearby rainshowers and thunderstorms, the 16-story launcher quickly vaulted into a cloudy sky just after sunset. The launch was a day later than planned because an erroneous measurement in the Ariane 5's liquid oxygen propellant system triggered an automatic hold in the countdown Tuesday. No significant glitches occurred in Wednesday's countdown, and the rocket's Vulcain 2 main engine ignited at 2150:55 GMT (4:50:55 p.m. EST), ramping up to nearly 300,000 pounds of thrust. Seven seconds later, after a computer-run health check of the launcher, the Ariane 5's twin solid rocket boosters ignited with an explosive thud to push the vehicle into the sky and northeast from the South America coastline. The Ariane 5 rocket deployed the ATV payload in space 64 minutes later over the Tasman Sea between Australia and New Zealand. The rocket released the 44,000-pound spacecraft, the heaviest payload ever launched by Ariane, right on the mark in a nearly perfect circular orbit 160 miles above Earth. "This exceptional launch was the 200th for Ariane, and therefore marks a particularly important step for European space," said Jean-Yves Le Gall, chairman and CEO of Arianespace, the commercial operator of the Ariane rocket family. 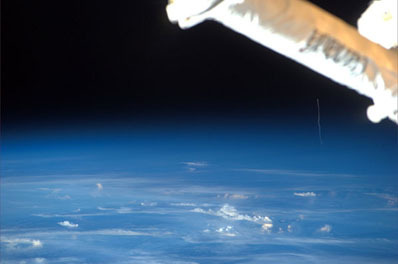 Astronauts on the International Space Station took advantage of some fortuitous orbital mechanics to snap pictures of the Ariane 5 rocket ascending from the jungles of French Guiana. Italian flight engineer Paolo Nespoli sent back two photos from the lab's cupola module. 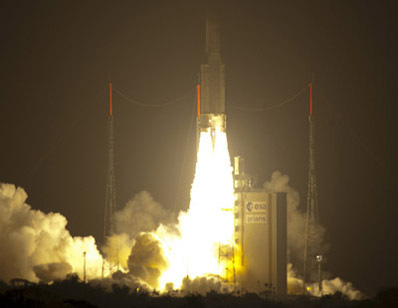 "We usually see an Ariane launch from the ground, but this time we have pictures from yet another perspective, in space," said Jean-Jacques Dordain, ESA's director general. Christened Johannes Kepler after the famous German astronomer and mathematician, the 33-foot-long spacecraft deployed its four solar array wings about 25 minutes later. Arranged in an X-shaped pattern, the solar panels stretch 73 feet across and began charging the ship's batteries as planned, according to the European Space Agency. The cylindrical spaceship also activated its GPS satellite navigation system and deployed a communications antenna to exchange data with the space station during docking, according to Nico Dettman, ESA's ATV program manager. It is the second flight of Europe's ATV system, which was started in 1995 to help pay for ESA's share of the space station's operating costs. The agency spent about $2 billion developing the high-tech spacecraft, and each mission costs about $600 million. ESA plans up to seven ATV missions through about 2017. The first ATV flight, nicknamed Jules Verne, successfully demonstrated the craft's design in 2008. The next European resupply freighter is due to launch in February 2012. "ATV Johannes Kepler is inaugurating our regular service line to the ISS," said Simonetta Di Pippo, ESA's director for human spaceflight. The automated cargo craft has a series of orbit-raising and rendezvous engine burns planned over the next week, leading to a docking with the space station's Zvezda module Feb. 24 at about 1046 GMT (10:46 a.m. EST). The space station docking is scheduled just hours before the launch of space shuttle Discovery, which is targeting blastoff for 2150 GMT (4:50 p.m. EST) the same day. Despite initial reports the ATV's launch delay this week would postpone Discovery's flight by a day, a NASA spokesperson Wednesday said the shuttle could still lift off Feb. 24. NASA managers will make a formal decision on Discovery's launch date Friday in a flight readiness review. The station station is in the middle of a jam-packed manifest of visiting servicing and assembly missions. A Russian Progress unmanned resupply craft launched to the outpost last month and another Progress is slated to leave this weekend. Japan's H-2 Transfer Vehicle, similar in size to the ATV, arrived at the station Jan. 27, and the shuttle Discovery will bring an Italian stowage module to the lab next week. "This launch takes place in a crowded and changing manifest for the ISS access, with HTV, Progress, ATV and the shuttle coming and going," Dordain said. The ATV will be the biggest space station resupply craft after the shuttle's retirement, placing it in a crucial role to keep the lab operating. It has the ability to feed rocket propellant, water and oxygen into the space station, plus haul dry cargo such as experiments and provisions for the outpost's residents. Once the space shuttle is retired later this year, the station will rely on a mixed fleet of logistics vehicles for cargo needs. 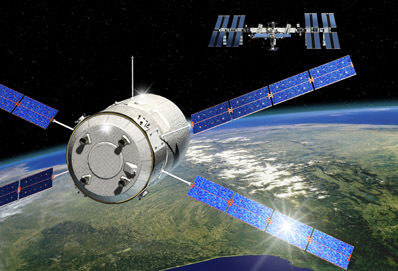 NASA is partnering with SpaceX and Orbital Sciences Corp. to develop commercial resupply capsules expected to be operational by early 2012. The Johannes Kepler mission carries about 3,500 pounds of dry cargo in its pressurized cabin to be manually unloaded by the astronauts and cosmonauts aboard the space station. About 1,875 pounds of maneuvering propellant and 220 pounds of breathing oxygen will be transferred through plumbing from the ATV to the Russian segment of the complex. Another 14,475 pounds of rocket fuel inside the spacecraft will guide the ATV to the space station and boost the lab's orbit by up to 25 miles this spring.